panelboard is protecting feeder conductors and sub panel. So..would this be the infamous "Delta Breaker" in 384-16-f ? You are correct. I presented this code violation in a previous post. (Code Forum) I thought I would send a photo of the sub-panel. As you can see at a glance, it looks perfectly legal. 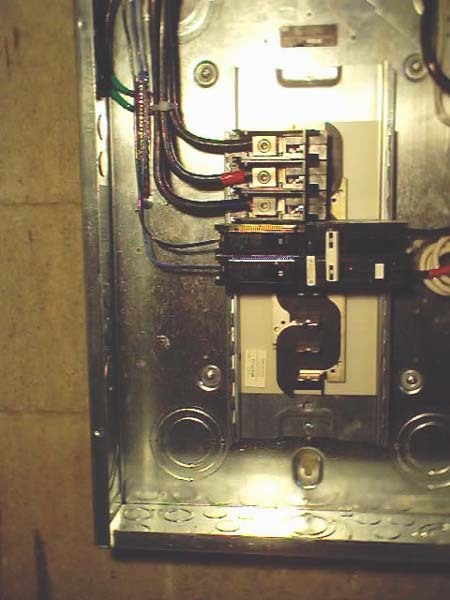 (Without taking voltage readings) Once the Inspector had the service panelboard cover removed the code violation was quite obvious. The Delta breaker deal has been, to my knowledge, a no-no for 2 or 3 decades. There is confusion as to how the introdution of a third leg ( or in this case 2-A legs, 1-B leg ) was accomplished, simply because nobody is going to advertise this . Perhaps you could give us a little history thread on this sometime here? PS- I wonder if that 2-pole GFI would work on A+A phase ?? Frank said that a 3pole 100a breaker was in the singlephase panel that fed this. That's where the 3 wires come from - ABA or BAB sequence I would assume. article search and type delta breaker.If I can think of any more references I will keep you posted. That link doesn't work, Trt this one.